Emily McShane, Bernadette Flanagan, Blaithin Loughran, Deirdre Brennan (no longer with the group), Maeve Flanagan, and Pamela Geraghty. With their melodious voices, masterful musicianship and enthusiasm, the Irish American women’s group Girsa has captured the hearts of audiences everywhere by bringing a creative mix of vocals, fiddle, accordion, banjo, tin whistle, bodhran, guitar, and piano to their shows. Kristin Cotter McGowan stops by a Girsa rehearsal. My welcome into the home of Rose Flanagan, former Cherish the Ladies fiddler and mother to Girsa members Maeve and Bernadette, is as warm and inviting as the young women gathered around the table. 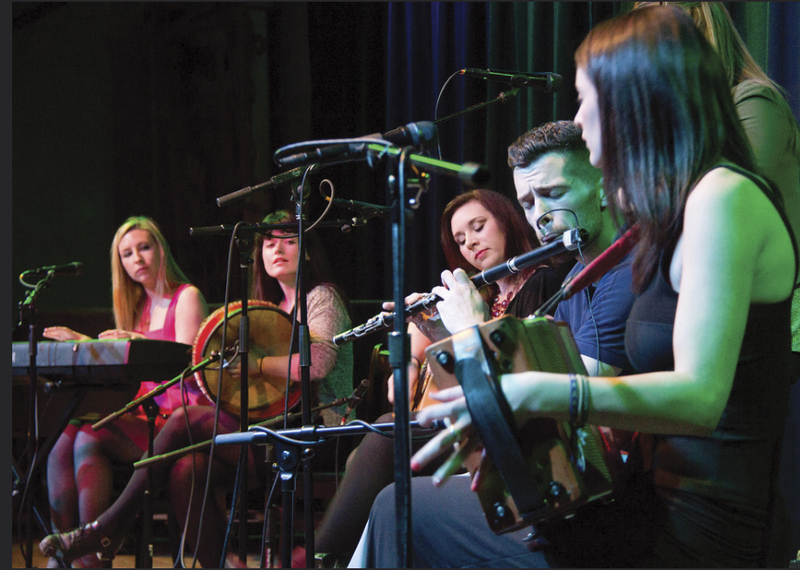 Girsa, Irish for “young girls,” is the exciting next generation of Irish traditional musicians. The Flanagan sisters, joined by their friends, cousins Pamela Geraghty and Emily McShane, laughed and joked with each other, catching up to rehearse for an upcoming show and tell me their story. “With each other,” corrects Rose. Girsa was raised on Irish music; their families encouraged them – “we were forced!” they joke – to play at every gathering. They started lessons early on and quickly excelled in many music and dance competitions here and in Ireland. Maeve plays fiddle and whistle, and has written several tunes for their latest CD, A Sweeter Place, blending a modern sound with traditional style. Her sister Bernadette plays bodhran and piano, and is an award-winning step dancer. Emily plays piano and along with her cousin Pamela, also sings and plays guitar. Pamela also plays accordion along with Blaithin “Bla” Loughran. (Blaithin, a champion accordion player, is away at school and unable to make this rehearsal). 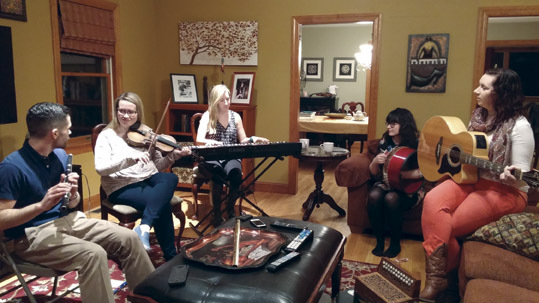 Rehearsal at the home of Rose Flanagan, herself a former Cherish The Ladies fiddler, are flute player Sean Tierney, a regular guest performer with Girsa, Maeve Flanagan, Emily McShane, Bernadette Flanagan, and Pamela Geraghty. It was Pamela’s mother who said the group needed to give themselves a name and start playing gigs. Regular Sunday appearances at the Porter House in Montvale, New Jersey and Rory Dolan’s in Yonkers, New York, solidified the group and built its fan base. There were plenty of kids who could play music, but if these youngsters were exceptionally good, it’s because it’s embedded in their DNA, and their talents were nurtured by great musicians. Many of Girsa’s teachers, including Maeve and Bernadette’s mother, played with the celebrated Irish music group Cherish the Ladies, whose front woman, Joanie Madden, lauds Rose and her fellow teachers for their commitment to keeping traditional Irish music alive. “When the great teachers from the 1970s passed away or stopped teaching, mothers who had played when they were younger and now wanted their own children to learn, pulled out their instruments, started practicing again, and started teaching,” Madden said. In the spirit and tradition of their teachers, the young women of Girsa, who are now in their very early 20s, are also instructors of fiddle, whistle, piano, and sean-nós, or “old style,” singing. In addition to the fundamentals, the girls instruct their students on the performance aspect of music. Girsa on stage: Emily McShane, Bernadette Flanagan, Pamela Geraghty, flute player Sean Tierney, the newest member of the group, and Blaithin Loughran. Both Pamela and Emily teach at the Erin Loughran School of Irish Music & Arts. Erin is a former Girsa member and a sister to Blaithin. In their eleven years together, Girsa has released two CDs and an EP, and has toured, playing gigs in the trendy Austin music scene, a stint at Disney World, and the trifecta of summer Irish Festivals – Kansas City, Dublin (Ohio), and Milwaukee. A typical year brings a March madness lineup of St. Patrick’s Day shows, summer and fall festivals, and Christmas concerts. The girls all have a hearty laugh at this. Maeve: “Forming words?” (More laughter). The evening’s rehearsal was not only to prepare for upcoming shows, but to welcome their newest member, the sight of which may give audiences another reason to stand up and take notice. Sean Tierney, a “he” in the house of “she,” brings a wealth of talent, playing the flute, uilleann pipes, low whistle, sax, and ‘foot percussion’ as a step dancer. They’ve all known each other since childhood, making this transition a seamless one. Kristin Cotter McGowan is a writer and a musician. She lives in Glen Rock, NJ, with her husband and three daughters. Together they own and run Carrick Mór, a gift shop specializing in the best of Ireland and Irish culture. First saw Girsa at the WV Cultural Center in Nov. 2011(?) Loved you; beggin’ for you to come back. You’ll always be young forever”in my heart.